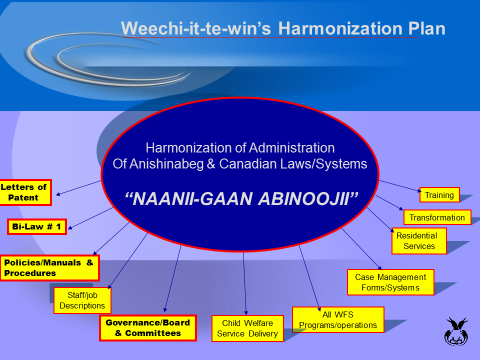 For Weechi-it-te-win Family Services and the ten Community Care Programs, Naaniigaan Abinoojii is our central thought and purpose. “The child’s best interest is always First and Foremost”; it is always of paramount consideration. 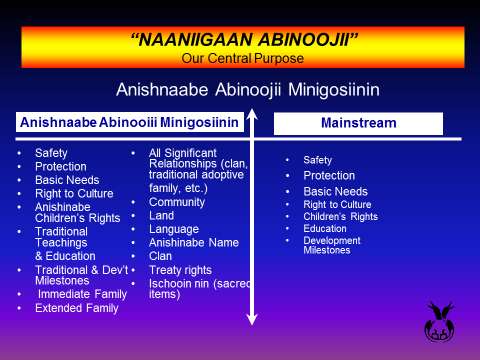 Naaniigaan Abinoojii is a spiritual teaching based in the traditional child rearing practices of the Anishinaabe. It is for this purpose, that Weechi-it-te-win engaged in ceremony to incorporate this teaching into our service delivery system. 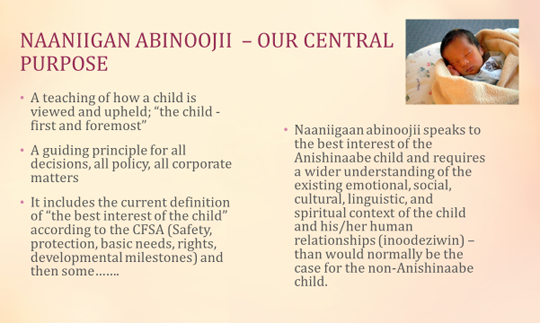 The catalyst for embracing the Naaniigaan Abinoojii teaching into our corporate documents was the child welfare transformation, specifically Bill 210 (2006) which legislated guidelines for permanency with respect to children in care. As a result of Bill 210 various regulations and compliance measures were introduced that were not viewed as culturally competent by Weechi-it-te-win or its’ Community Care Programs. Weechi-it-te-win’s Executive Director at the time (George Simard) and his Directors worked diligently to develop an Anishinaabe Alternative to the new legislation. Once again, Weechi-it-te-win returned to its elders and Anishinaabe language speakers to bring our traditional ways of child rearing to the forefront, as these are the ways and means that have always carried our children to grow into healthy, purposeful beings. At Weechi-it-te-win, “Naaniigaan Abinoojii” is our foundation, and we are thankful to every person who gave “life” to this special and unique part of Weechi-it-te-win. 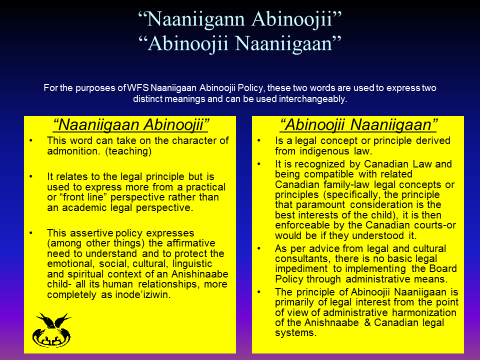 “ABINOOJII NAANIIGAAN” EXPRESSES A LEGAL CONCEPT FROM THE TRADITIONAL LAW OF THE ANISHINAABE PEOPLE. THERE IS NO CONFLICT BETWEEN THIS CONCEPT AND THE ENGLISH-LANGUAGE CONCEPT “THE BEST INTERESTS OF THE CHILD”. THE PRINCIPLE IS THE SAME. HOWEVER THERE WILL OFTEN BE PRACTICAL DIFFERENCES BETWEEN ABINOOJII NAANIIGAAN FOR AN ANISHINAABE CHILD AND THE BEST INTERESTS OF A NON-ANISHINAABE CHILD. EITHER CHILD WOULD LIKELY HAVE PHYSICAL AND EMOTIONAL TIES TO ITS IMMEDIATE (E.G. NUCLEAR) FAMILY THAT SHOULD BE PRESERVED WHEREVER POSSIBLE IN ANY CULTURE. THE DIFFERENCES ARISE FROM THE PHYSICAL, EMOTIONAL, SOCIAL, CULTURAL, LINGUISTIC AND SPIRITUAL TIES THAT AN ANISHINAABE CHILD HAS AND SHOULD HAVE WITHIN THE SACRED CIRCLE OF INAAWENDIWIN, WHICH INCLUDES ITS IMMEDIATE AND EXTENDED FAMILIES, ITS ANISHINAABE COMMUNITY AND ITS ANISHINAABE PEOPLE. IDENTIFYING THE BEST INTERESTS OF AN ANISHINAABE CHILD THEREFORE REQUIRES A MUCH WIDER UNDERSTANDING OF THE EXISTING EMOTIONAL, SOCIAL, CULTURAL, LINGUISTIC AND SPIRITUAL CONTEXT OF THAT CHILD – ITS HUMAN RELATIONSHIPS, MORE COMPLETELY EXPRESSED AS INOODEZIWIN - THAN WOULD USUALLY BE THE CASE FOR A NON-ANISHINAABE CHILD. IT CALLS FOR A CAREFUL WEIGHING OF ALL FACTORS AFFECTING THE SAFETY AND WELL-BEING OF THE ANISHINAABE CHILD INCLUDING THE WIDER RANGE OF CARING OPPORTUNITIES THAT MAY ARISE FROM THOSE HUMAN RELATIONSHIPS AND THE CORRESPONDINGLY WIDER VULNERABILITY OF THE ANISHINAABE CHILD TO DAMAGE IN ITS HUMAN RELATIONSHIPS. GENERALLY SPEAKING, AVOIDABLE DAMAGE TO THESE RELATIONSHIPS IS NOT CONSISTENT WITH THE BEST INTERESTS OF THE CHILD. IT SHOULD BE AVOIDED. THE QUESTION OF WHAT DAMAGE IS AVOIDABLE IS CENTRAL TO ASSESSING NEEDS AND PLANNING CHILD CARE SERVICES. IT MAY INVOLVE WEIGHING POTENTIAL DAMAGE TO A CHILD’S PHYSICAL AND EMOTIONAL SAFETY INHERENT IN CHILD CARE ARRANGEMENTS AGAINST CERTAIN DAMAGE TO THE CHILD’S EMOTIONAL, SOCIAL, CULTURAL, LINGUISTIC AND SPIRITUAL SAFETY AND WELL-BEING THAT MAY BE LIMITED OR AVOIDED BY THOSE CHILD CARE ARRANGEMENTS. THIS WEIGHING MUST NOT BE INFLUENCED BY ANY POLITICAL CONSIDERATIONS. NAANIIGAAN ABINOOJII! WHEN A CHILD IS AT RISK THERE WILL USUALLY BE NO OPTION THAT CAN ELIMINATE ALL RISK. THE RESPONSIBILITY OF THE FIRST NATION TEAMS SUPPORTED BY AND WITH THE AUTHORITY OF WEECHI-IT-TE-WIN FAMILY SERVICES INC. IS TO MINIMIZE THE RISK. THIS CANNOT BE ACHIEVED BY FOCUSING ON PHYSICAL SAFETY IN THE ABSENCE OF OTHER ASPECTS OF THE CHILD’S SAFETY AND WELL-BEING. IT CAN BE ACHIEVED ONLY BY WEIGHING ALL OPTIONS IN TERMS OF GAANAANDAAWE BIMAADIZIWIN (INADEQUATELY EXPRESSED IN ENGLISH AS THE CHILD’S PHYSICAL, EMOTIONAL, SOCIAL, CULTURAL, LINGUISTIC AND SPIRITUAL WELL-BEING AND SAFETY).